Ten years ago, the Federal Reserve, the central bank of the United States, launched the first of several rounds of Quantitative Easing in response to the Global Financial Crisis, which drastically increased the size of its balance sheet. Since then, the Fed has been looking to roll back this expansion in an effort to “normalise” monetary policy. A good time to take a closer look. As always, the St. Louis Fed's economic data portal FRED is the place to go. FRED provides a wealth of economic data, easily accessible from within R and other languages. Using the pdfetch package, we first pull the relevant data series from FRED via pdfetch_FRED(c("WALCL", "WGCAL", ...). We also consolidate some of the lesser important balance sheet items into broader categories. We then get the data into shape for ggplot2 to give us an area plot. For liabilities to be plotted in negative territory, we need to multiply them by -1 and reverse their ordering using bs.order <- c(grep("^a", bs.names, value = TRUE), rev(grep("^l", bs.names, value = TRUE))). We also want an interactive plotly chart, so we reduce the frequency to monthly (this will reduce the payload and make the graph more responsive) before feeding the data to plotly in a loop to create a stacked bar chart. With bar charts plotly allows users to display specific components separately, which can provide better understanding for how different series relate to each other. Click here for the interactive plot. Looking at the balance sheet in detail shows that the Fed used to hold mainly “claims on the government” (US Treasury bills and bonds) on its asset side, but we see a significant pick-up of “claims on the private sector” after the crisis. This includes things like Mortgage-Backed Securities, agency debt, and the portfolio of Maiden Lane, among other things, which the Fed acquired in the wake of the Lehman Brothers collapse. We also see the item “foreign reserves” spiking around the same time, as foreign central banks drew on their liquidity swaps with the Fed to provide their own markets with dollar liquidity. 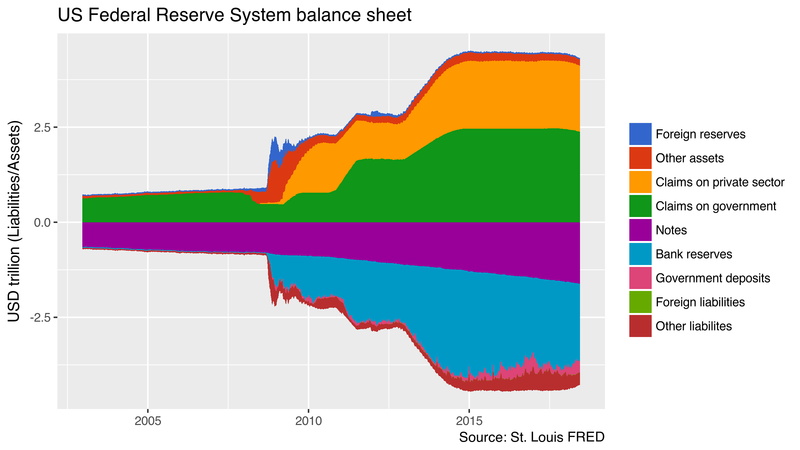 The expansion of the Fed's assets was matched nearly one-to-one by an expansion of bank reserves on the liability side. Indeed, if we look at the items “notes” and “bank reserves” together, they account for the bulk of the increase of the Fed's assets as well as its variance.